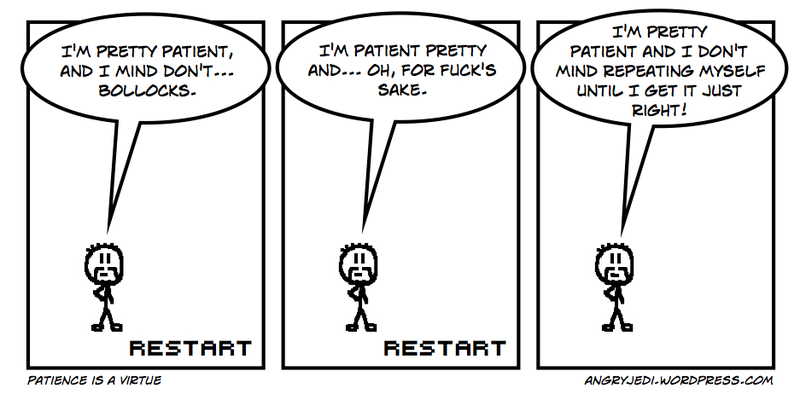 As the saying goes, ‘patience is a virtue,’ and it certainly is. It can also be an antidote to anger and hatred. However, it can actually be quite difficult to be patient. When I was in my twenties it was the one thing I had very little of. I had just been promoted to manager and I had very few man-management skills, so I wanted things done as soon as I mentioned them, not only that, I wanted them done my way, because I was manager and I knew best – really, I actually used to think like that. I cringe now thinking about it. I used to think that people really tried my patience, until I started to follow Gautama Buddha’s teachings and then I realised the problem was actually mine. There was nothing outside of me causing my impatience, it all stemmed from my own mind. The problem wasn’t what people were doing, it was they way I was reacting to what they were doing. I had one teaching where the teacher explained a jug is filled drop by drop. That really struck a chord with me, because it made me realise things are achieved slowly, and whenever I started to get impatient I would recall those words, and that helped me to calm down. So what is patience? It is unconditionally accepting what is happening right now in the present moment. When you lack patience you are rejecting the present moment, substituting some future moment from your imagination, thinking that this future moment will help solve the imagined problem with the present moment. So we can only have patience when we are present in the moment. Patience and the lack of it are emotions and can be worked on during your meditation session. When I looked back over my day and saw that I had been impatient, which in the early years was quite a lot, I would see that the only person who was suffering greatly was me. I was making myself agitated, tense and angry. It was only after looking closely at my impatience that I could start to let it be. Now, I cannot say my impatience has gone forever, that would be unreasonable, but I am able to catch it as it rises and then let it be. Some people believe that by meditating we will be able to stop all of our emotions and feelings from arising, that seems to be a common misunderstanding in Buddhism. I think it is impossible to stop our emotions and feelings from arising, but we can at least be aware of them when they do arise. This way we will be able to let them be and not just blindly follow them. I am going to digress a little bit here, but I just want to tell you a story about stopping your emotions. I read a book once written by a Western lama (someone who has done a three year retreat) and he was recounting the day of 9/11. He said that he was so far into his practice that he had no emotions when watching the plane fly into the tower. He didn’t feel that it was good or bad. He said he didn’t feel anything. I am not sure I believe him. If we were able to fully stop our emotions, we would just become a cabbage. If I thought Gautama Buddha’s teachings were going to do that to me, I would stop practicing straight away. If a teacher promises you that his practice can stop your emotions, run as fast as you can. What we are looking for is an understanding of what triggers them and have an antidote ready for when they arrive. We have to face up to them and not try to transcend them. Emotions help us see right from wrong, pleasure from pain, so by removing them we are removing a built in value system. This value system has built up over the years from our experiences, and even though these experiences are filtered through our view of the world, they are still a valuable tool for us to distinguish what is socially acceptable. If we are an impatient person we have to work out why that is. It is usually because we are trying to multi-task, we have set ourselves an impossibly tight schedule or we think we know better than others. We may just be feeling anxious, unhappy or worried and not even know that it is because of impatience. It really does help to be aware and your meditation session is a great tool for that. You can look for patterns and triggers, and then work on an antidote. via The virtue of patience – Buddhism Guide. This entry was posted in Uncategorized and tagged Anger, Buddhism, Patience, Present moment. Bookmark the permalink.